I apologize for the blur. Been rushing lately with the move and all, my pictures have been suffering. Used the little fishy stamp from A muse which I colored with my Prisma pencils and blended. Love how the colors aren't flat like with markers (not copic though!) or just pencils alone. Made sure to keep them light on the top sides because of the sun, right?! The one little fishy is pink with glitter...made this last week for the challenge, still finding glitter on myself every day. Didn't have any Best Fishes stamp so I used the one that reads, It's the little things that matter. Patterned paper is super old KI Memories. Rounded all the corners of the card just to make it a little different. Another great cute card Simone. Great card! I love the color job -I may need to break out my pencils again - they must feel neglected!! lol I haven't seen that fish stamp before- soo cute. Cute card, Spazzy! I love the whole LO of the card. I like the circles at the bottom. Glitter, huh? "The herpes of the crafting world..."
Girl, this card rocks!!!!! I love, love. love this color combo and your coloring is superb. YOu are such a stitch! The Copics would only cost you one kidney...you could live without one! You a maka me laugh...what movie WAS that from? 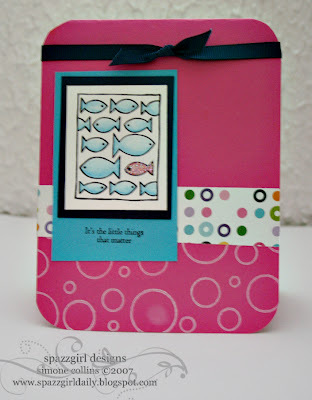 Love the fishy card!